A powerful Nor’easter will explode (‘bomb out’ or rapidly deepen) off the Mid-Atlantic coastline and track very close to New York City Thursday. An upper level low will close off and the jet stream will become inverted (southeast to northwest orientation) as a massive ‘blocking’ ridge of high pressure sits over the Canadian Maritime. These synoptic patterns will allow this system to wobble and stall out as it rapidly deepens and tracks northwest instead of northeast (due to the inverted trough axis – or ‘negatively tilted trough). 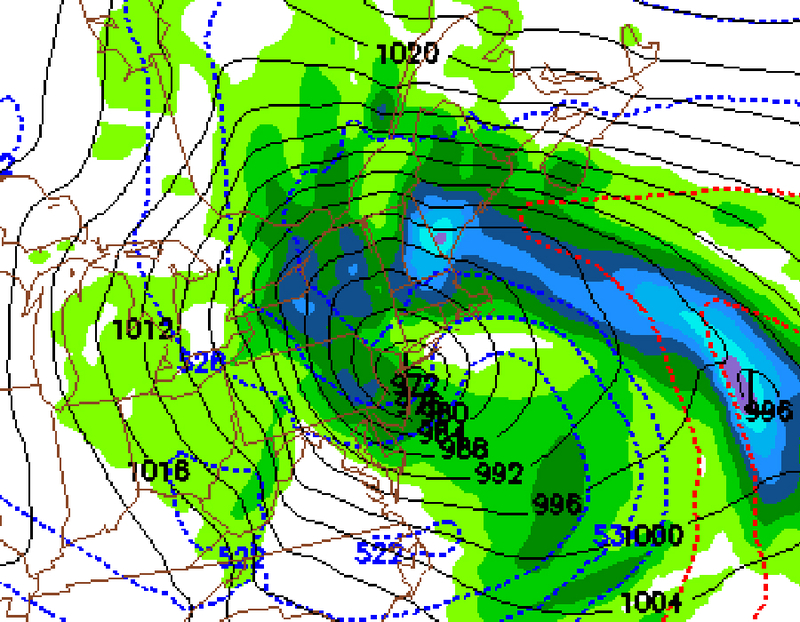 The image above is the NAM (North American Model) forecast for Friday morning… depicting heavy snow and white out conditions from Baltimore’s northeastern suburbs to the Philadelphia Area …Poconos… Catskills…Finger Lakes…Hudson Valley and Adirondacks. Sleet, rain and snow (nasty mix) would be pounding New England as strong southeast winds bring mild air into the mid layers of the atmosphere (thanks to the inverted/negatively tilted trough set up). Washington and Baltimore Areas: **Heavy Snow now possible Thursday into Friday with white out conditions and accumulations (highest north and east of D.C.) Wind gusts over 50 mph are possible with power outages making travel very difficult. 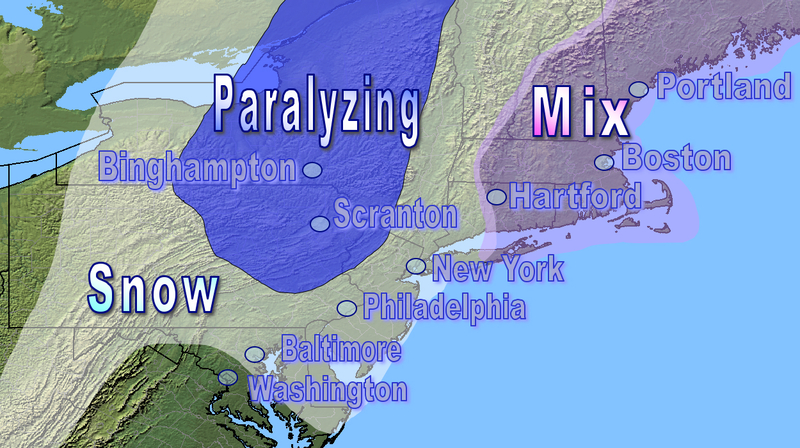 Philadelphia : Very heavy snow with blizzard conditions likely. New York City: A mix of snow and rain (due to proximity to the low pressure track)… heavy at times with white out conditions. Northern NJ- The Poconos – Central New York: Easily 2 Feet of snow could fall across these areas with 60 mph wind gusts – blowing and drifting snow (paralyzing storm). 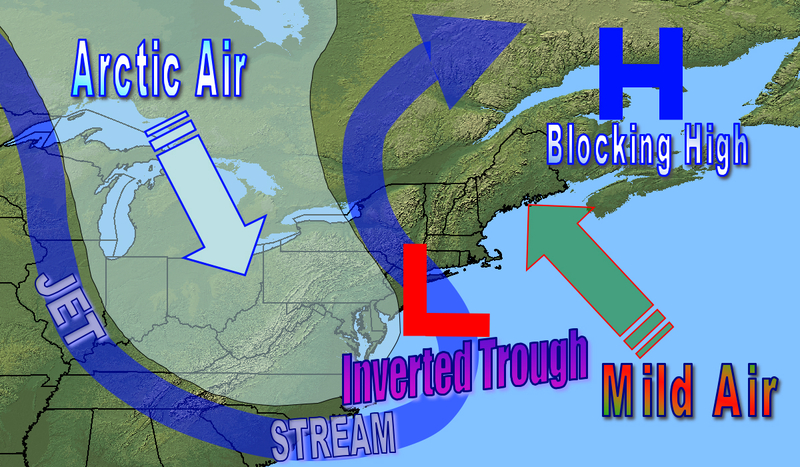 From Hartford & Boston to Portland to Bar Harbor – With a Jet Stream screaming out of the SOUTHEAST – a nose of warm maritime air at the mid-levels will produce very heavy rain, sleet and wet snow, cutting down on accumulation potentials along the 95 corridor. Go west of the Connecticut River Valley and that’s where the heaviest accumulations will be. Next Post And the Winner Is… BWI Airport! EXPECTED TO CONTINUE THURSDAY AND THURSDAY NIGHT. * WINDS…NORTHWEST WINDS 10 TO 15 MPH WEDNESDAY NIGHT.